Supreme Court nominee Judge Brett Kavanaugh testifies before the Senate Judiciary Committee on Sept. 6, the third day of his Supreme Court confirmation hearing. 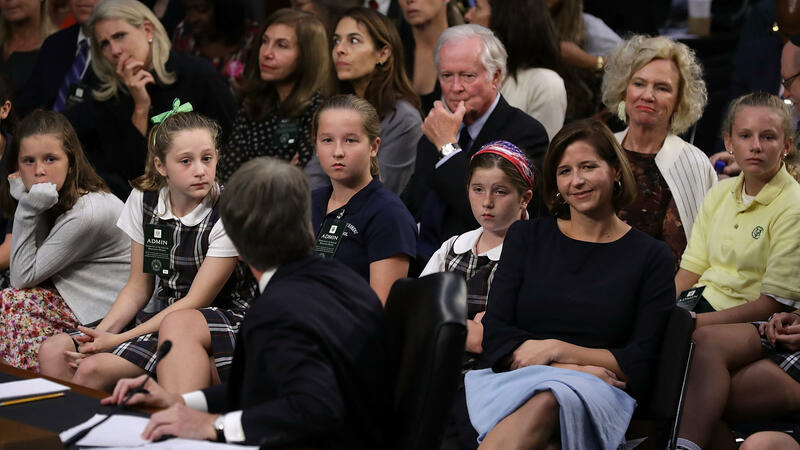 Children who played on sports teams coached by Kavanaugh attend the third day of his hearing, along with his wife, Ashley, and daughters, Lisa (from second left) and Margaret, and his parents, Everett and Martha Kavanaugh. 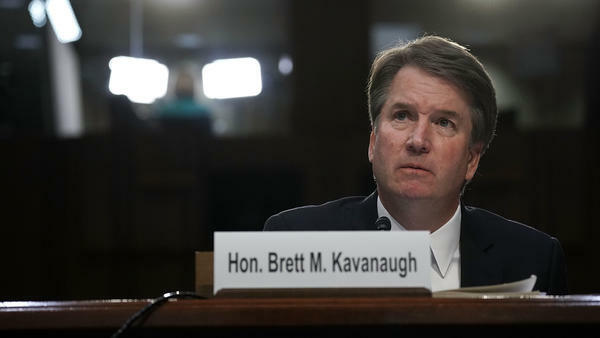 Supreme Court nominee Judge Brett Kavanaugh says he isn't considering withdrawing following more allegations of sexual misconduct from decades ago, and he proclaimed his innocence in a new TV interview Monday evening. "I'm not going to let false accusations drive us out of this process," Kavanaugh told Fox News' Martha MacCallum in an interview alongside his wife, Ashley. "We're looking for a fair process where I can be heard and defend my integrity and my lifelong record of promoting dignity and equality for women, starting with the women who knew me when I was 14 years old. 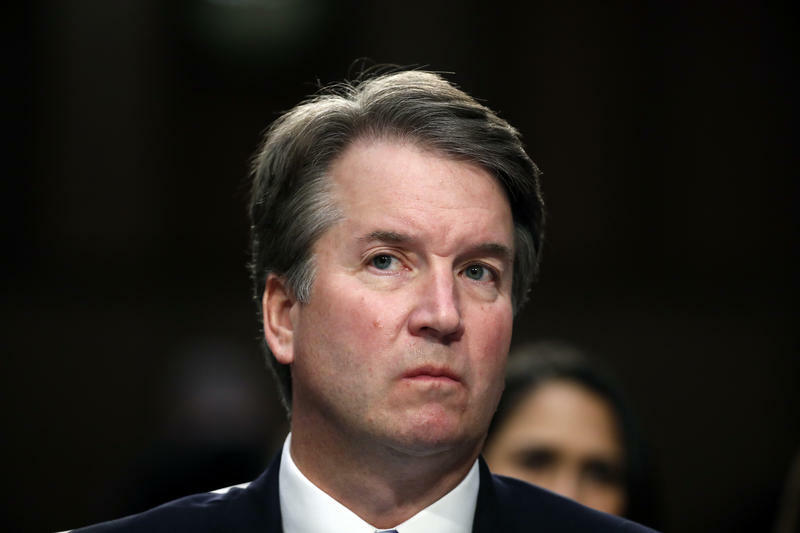 I'm not going anywhere," Kavanaugh said. "I know I'm telling the truth. 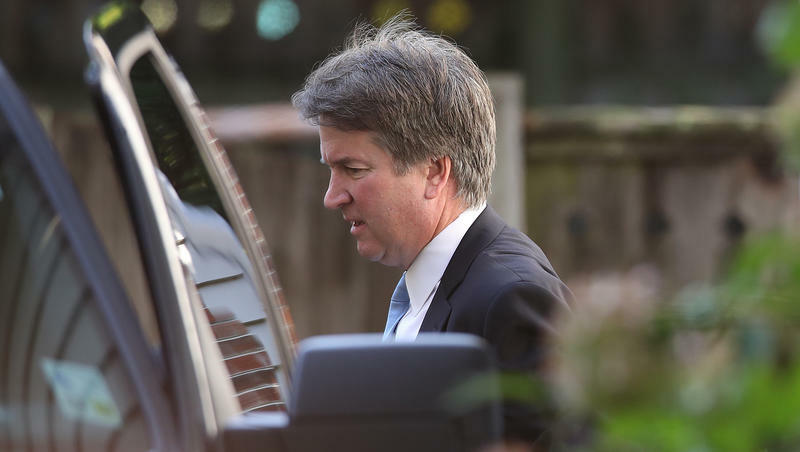 I know my lifelong record, and I'm not going to let false accusations drive me out of this process," Kavanaugh continued. "I have faith in God, and I have faith in the fairness of the American people." The new interview with Kavanaugh comes after accusations surfaced Sunday night from Deborah Ramirez, who in a story published in The New Yorker alleges Kavanaugh exposed himself to her during a drunken party at Yale when they both attended college there in the 1980s. Thursday the Senate Judiciary Committee has scheduled a hearing into the allegation by Christine Blasey Ford that Kavanaugh groped her and tried to remove her clothes during a party when both were in high school in Bethesda, Md., more than 30 years ago. Ford and Kavanaugh have agreed to testify, although Sen. Dianne Feinstein, D-Calif., called for the panel to postpone the hearing following the allegation by Ramirez. Kavanaugh has denied the allegations leveled against him by both Ford and Ramirez, and in his interview with MacCallum said he has "never sexually assaulted anyone, in high school or otherwise." "I am not questioning, and have not questioned, that perhaps Dr. Ford, at some point in her life, was sexually assaulted by someone in someplace. But what I know is I've never sexually assaulted anyone," Kavanaugh said. Kavanaugh said he "may have met" Ford — who went to a private girls school while he went to a private Jesuit boys school in suburban Washington, D.C., during the early 1980s — but that "we did not travel in the same social circles." Ford is two years younger than Kavanaugh. Kavanaugh also said he was "never at any such party" back then like that Ford has described and that "I have never had any sexual or physical activity with Dr. Ford." Kavanaugh said that, yes, there were parties with alcohol that he attended while in high school, but there was never a time where he drank so much he couldn't remember his actions from the night before. "I have always treated women with dignity and respect," Kavanaugh repeated several times, and said most of his time in high school was spent studying, playing sports or going to church. "I'm a good person. I've led a good life. I've tried to do a lot of good for a lot of people. I'm not perfect. I know that. None of us is perfect ... but I've never ever done anything like" either Ford's or Ramirez's accusations. Ashley Kavanaugh also said she believed her husband's denials and said the confirmation process had been hard on their family, including their two daughters. "I know Brett. I've known him for 17 years and this is not at all who [he is]. It's really hard to believe," she said. "He's decent. He's kind. He's good. I know his heart. This is not consistent with Brett." Sen. Susan Collins, R-Maine, is among the Republicans calling for the committee to look into the allegations by Ramirez. Collins says she has not decided whether she will support Kavanaugh and she is looking to the upcoming hearing with Ford and the judge before she makes up her mind. 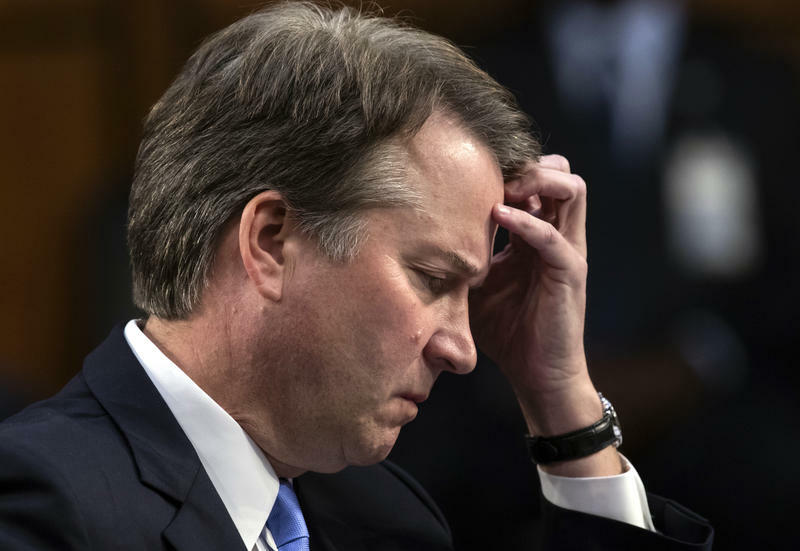 "I think that the committee investigators should reach out to Deborah Ramirez in order to question her under oath about what she's alleging," Collins said. "I'm eager for the hearing to take place this Thursday and hear from both Judge Kavanaugh and from Dr. Ford." Sen. John Cornyn, R-Texas, a senior member of the Senate Judiciary Committee, told reporters Monday that committee lawyers have been in touch with lawyers for Ramirez and they are talking. He would not say whether he expects a public hearing on Ramirez's allegations. President Trump reiterated his support for Kavanaugh again on Monday, telling reporters on his way into the United Nations on Monday morning that Kavanaugh "is an outstanding person, and I am with him all the way." He said the charges "could be one of the single most unfair, unjust things to happen for a candidate for anything." The women making the allegations, Trump said, "were coming out of the woodwork" and, he said, "in my opinion totally political." And in a tweet to his more than 50 million followers Monday evening Trump touted the Fox News interview and added "This is an outstanding family who must be treated fairly!" Kavanaugh told MacCallum that Trump had called him Monday afternoon to say "he's standing by me." "These are smears, pure and simple. And they debase our public discourse. But they are also a threat to any man or woman who wishes to serve our country. Such grotesque and obvious character assassination—if allowed to succeed—will dissuade competent and good people of all political persuasions from service." The committee also released a letter from Ford, dated last Saturday, in which she said coming forward with her charge was "something that a citizen couldn't NOT do. I felt agony yet urgency and a civic duty to let it be known, in a confidential manner, prior to the nominee being selected." "Mr. Kavanaugh's actions, while many years ago, were serious and have had a lasting impact on my life. I thought that knowledge of his actions could be useful for you and those in charge of choosing among the various candidates. My original intent was first and foremost to be a helpful citizen – in a confidential way that would minimize collateral damage to all families and friends involved." Meanwhile, Senate Majority Leader Mitch McConnell, R-Ky., also accused Democrats of a "shameful, shameful, smear campaign" against Kavanaugh and vowed he will receive an up-or-down vote on his nomination on the Senate floor on "in the near future." Republicans on the Senate Judiciary Committee met Monday evening in McConnell's office to discuss the Thursday hearing. Several members said there was clear agreement that the hearing will go forward. They also discussed the possibility of bringing in an outside attorney to question Ford for the GOP lawmakers. Cornyn said the committee is still deciding who will question Ford. "I think we're leaning towards a staff lawyer, outside lawyer do it on our side for continuity," Cornyn said. "Rather than have 11 people ask questions for five minutes each but I don't know what the Democrats will decide to do." Cornyn said the committee could vote as early as the end of this week on Kavanaugh's nomination — leaving little time between Ford's testimony and that possible vote. Days before the Senate is set to hear from a woman who alleges that Supreme Court nominee Brett Kavanaugh attempted to sexually assault her while in high school, Kavanaugh is denying fresh accusations from a college classmate who also alleges he acted inappropriately toward her. A former classmate of Christine Blasey Ford tells NPR that she does not know if an alleged sexual assault by Supreme Court nominee Brett Kavanaugh took place as she first suggested on social media. "That it happened or not, I have no idea," Cristina King Miranda told NPR's Nina Totenberg. "I can't say that it did or didn't." That's different from what Miranda wrote Wednesday in a now-deleted Facebook post that stated definitively, "The incident DID happen, many of us heard about it in school." The Senate Judiciary Committee will move forward with a hearing scheduled for Monday on sexual assault allegations against Supreme Court nominee Judge Brett Kavanaugh, despite a request for further investigation from his accuser.